Last month I told you about how we have improved the QNET Resources that are available with each of the six QNET trainers. I also briefly highlighted the QNET trainers themselves and their ability to help you teach the basics of servo, process, and task-based control, plus introductory flight control, bio-instrumentation and mechatronic sensing. In this post, I want to continue the QNET trainers story along two lines: the key control topics they help you teach, and the value of exposing your students to fundamental control principles using industry-relevant LabVIEW™ graphical programming software. The following chart gives a concise mapping between the QNET boards and several controls topics that are common to the study of control in not only mechanical, electrical, and aerospace engineering, but also computer science, applied physics and bio-engineering. The NI ELVIS II platform and LabVIEW controllers seamlessly complement the QNET line by directly mapping theory to practice, and offering students the hands-on, practical experience they need to compete and perform in industry today. At Quanser, a concept we strongly believe in is the “controls education continuum”. Essentially this continuum encompasses your students’ progress from the lower to upper undergraduate years, through to graduate studies or working in industry. QNET trainers, in conjunction with the LabVIEW graphical programming environment, occupy a key place in that continuum by offering a modular platform to span a student’s complete academic career. QNETs cover a wide range of controls topics, while the LabVIEW environment helps students to intuitively bridge the gap between theory and application by intuitively highlighting the direct correlations between the whiteboard and block diagram. Using LabVIEW, students can learn the essential skills of controls engineering including modeling, control design, simulation, implementation, and operation of a control system from a single environment. The LabVIEW skills they develop by using QNET trainers will be of great benefit when the time comes for the studensty to design controls for more complex plants. QNET trainers are a highly effective tool for teaching common control concepts to novice, intermediate and advanced engineering and applied science students. They are designed to fit on the National Instruments (NI) ELVIS II platform. Using the Quanser Rapid Control PrototypingToolkit, a wide range of advanced Quanser plants from helicopters to shake tables can be integrated quickly and easily into the LabVIEW environment. This enables students to complete a hardware continuum that compliments their progression in controls skills development from the QNET VTOL trainer all the way up to a 2 DOF Helicopter or 3 DOF Helicopter, or from a QNET Rotary Pendulum to a rotary servo-based 2 DOF Inverted Pendulum. 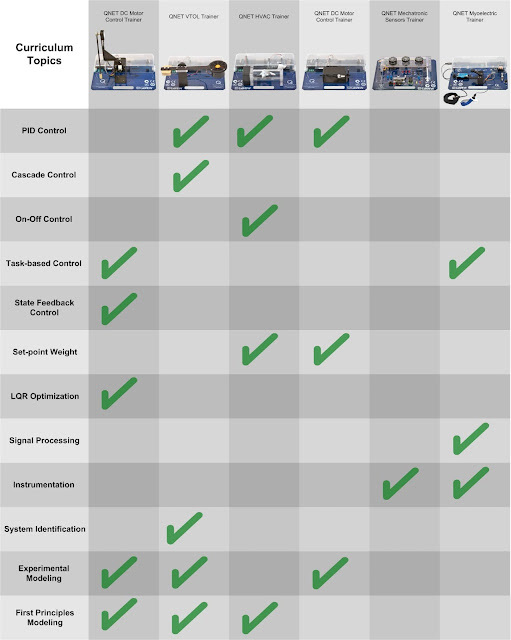 The fact that LabVIEW is widely used all across industry means students can immediately take their practiced programming skills from the academic realm directly to the factory floor. 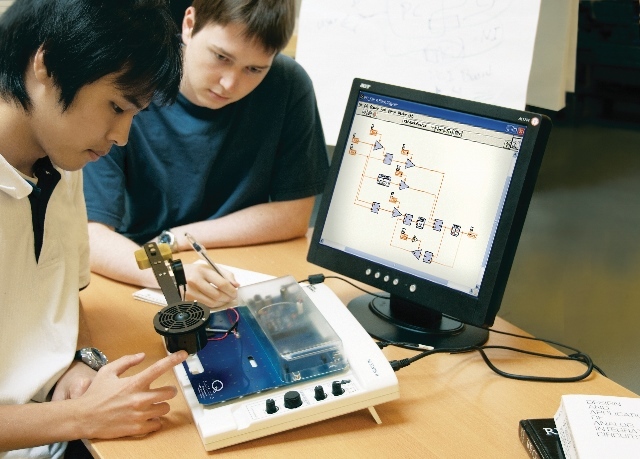 The combination of these two great tools – QNET trainers and the LabVIEW graphical programming environment – thus helps you provide your students with a clear and consistent learning progression, one that effectively prepares them to make an immediate contribution when they enter the challenging world of control systems engineering. can you send a pricelist for all this learning equipment to biola@vgtu.lt? Hello Gintaras, our Academic Solutions Specialist will get in touch with you shortly and discuss your teaching/research needs. Thanks for your interest!